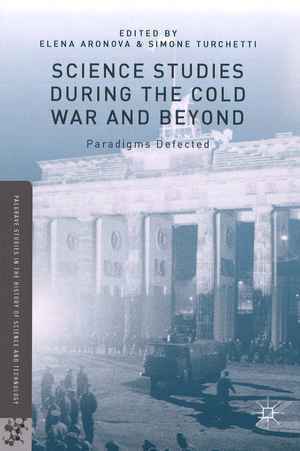 “Science Studies during the Cold War and Beyond” spells out what every practitioner in the field knows but rarely takes care to ponder: our research agenda is a product of the Cold War, no less so than atomic bombs or interdisciplinary area studies. Today, Science and Technology Studies (STS), is a multidisciplinary field consolidated by a shared goal: to break with a linear understanding of scientific and technological progress and to investigate the “co-production”, or interdependent relationships, structuring social, technological and scientific arenas. Yet the symmetry principle is generally embraced as a way to understand all histories but our own. As a matter of fact, the intellectual canon that holds Science Studies together is product of historical choices. How is it that certain modes of thought came to dominate and others, especially those of the Marxist tradition, are completely forgotten? This question is all but ignored by most introductory reading lists and handbooks. “Science Studies during the Cold War and Beyond” provides an occasion for self-reflection where the contours of institutional geography and intellectual hierarchies gain salience, personalities and intellectual identities interlock, and the stories that one may hear at a conference dinner table turn into historiographical questions relevant beyond the confines of our community. This alone is a reason enough to make the volume a must-read for all STS scholars and to attract a broader audience. Its multidimensional if not comprehensive scope ties in major topics of interest to the 20th century historians, such as the consequences of emigration patterns, the radicalism of the 1960s, modernization theories, and the rich history of Americanization and Sovietization. The main promise of tracing the disciplinary consolidation of STS is to better grasp the political stakes associated with diverging ideas about the making of modern societies. The introduction by Aronova and Turchetti makes a case for combining intellectual and transnational historical approaches in order to situate the emergence of Science Studies within the geopolitical context of the global struggle between the superpowers. The phrase “paradigms defected” in the book’s subtitle highlights the circulation and reception of ideas across nations, communities and generations. But it is the Cold War divisions that structure the ten chapters, which fall into three parts: Science Studies in the West, East, and beyond the blocs. Upon closer examination, the chapters’ geographical range includes the United States, Britain, Italy, Hungary, Poland, Czechoslovakia, Sweden, Argentina, and China. This distribution immediately leads one to question the absence of a Soviet case study. The answer appears in the footnotes, where multiple contributors engage with Aronova’s works and her arguments about the institutional and intellectual development of the Soviet discipline of naukovedenie in comparison with its Western counterpart. The chapter by Hans-Joachim Dahms highlights the interwar roots of Kuhnian “scientific revolutions” and asks: “What has the incorporation and possible transformation of contemporary results of sociology of science to do with the Cold War?” (p. 117) Although Dahms’ criticism is addressed at Kuhnian scholarship, it also challenges the book's Cold War framework. The variety of answers to the larger question of what it means to situate Science Studies in the Cold War context provided by the individual chapters is a gauge for appreciating the essays’ (not always equal) contributions to Cold War scholarship. George Reisch offers an original variation to the Cold War idea of containment, with a perceptive reading of the parallels between George Kennan’s and Thomas Kuhn’s depictions of the influence of ideology on the mind. The contributions by Ian James Kidd and Simone Turchetti reconstruct the complex intellectual and geographical landscapes of Western radicalism that nurtured the works of Paul Feyerabend and Paul Forman. Aant Elzinga analyzes a threefold dynamic taking place in Sweden: the country’s geopolitical neutrality and its “third way” between planned and market economy fostered interest in both Western and Eastern ideas about science and society as well as made it an effective bridge between the two. In his overview of the Latin American scholarship, Federico Vasen demonstrates how the Cold War and post-colonial dimensions were entangled by reconstructing the lines of critical engagement with both philosophical and policy elements and with capitalist and socialist models in the works of Argentinean intellectuals such as Mario Bunge, Gregorio Klimovsky, and Oscar Varsavsky. A cluster of contributions demonstrates that the now forgotten socialist models were diverse and represent a spectrum operating across the national cases under investigation. Whereas Gabor Pallo depicts an isolated post-1956 Hungarian community that steered away from controversial social and philosophical issues, the Chinese discipline of “dialectics of nature” is at the opposite of the spectrum. Lu Gao describes the rise of the discipline as an intellectual framework and a policy instrument under Mao’s personal patronage. The studies of the Polish and Czechoslovak cases by Michał Kokowski and Vítězslav Sommer, respectively, show an intricate combination of political and intellectual implications stemming from institutions, generations and intertextual references. First developing in early 20th century Poland, which saw important intellectual fermentation such as the questions leading to Ludwik Fleck’s famous work on the genesis of scientific facts, the intellectual line of naukoznawstwo developed within the institutional buildup under the Socialist regime as well as within the resistance movement. The field, however, came to an organizational collapse during the 1990s. Sommer’s analysis of the notion of “Scientific and Technological Revolution,” developed by the Czechoslovak philosopher Radovan Richta, is the volume’s most salient example demonstrating the depth and the spread of intellectual influences – ranging from Stalin’s theory of “active superstructure” to Daniel Bell’s “post-industrial society.” Sommer also reveals the checkered political fate of the concept appropriated by both the reformist movement and official political discourse. Still, the mapping of the intellectual and institutional landscape as provided by “Science Studies during the Cold War and Beyond” is by no means complete. For instance, the synoptic picture the editors seek cannot be composed without an explanation of the diffusion of the Actor Network Theory and the role of feminist scholarship. Moreover, in striking contrast with the relative gender balance throughout Science Studies today, even a quick glimpse at the volume’s index reveals the near absence of female names, which raises additional questions complicating our understanding of intellectual paths by social dynamics. The volume offers one productive way of addressing this question by including the voices of older members of the community, who explicitly draw on their personal experiences, alongside younger scholars relying on traditional sources as well as methods of oral history. These dialogues are crucial to the self-awareness and identity of our community. In the words of the editors: “the wider we cast our net, extending our histories beyond the more researched developments in the Anglophone West, the more complex and ambivalent both the ‘science studies’ and ‘the Cold War’ become outside these more familiar spaces.” (p. 8) Ultimately, the volume does not so much de-marginalize the Marxist history of science per se as it shows how the process of intellectual de-politicization as the field matured itself was a matter reflecting Cold War politics. For an example, see: Elena Aronova, The Politics and Contexts of Soviet Science Studies (Naukovedenie). Soviet Philosophy of Science at The Crossroads, in: Studies in East European Thought 63 (2011), no. 3, pp. 175–202. The Latin American case relates to a larger phenomenon. Dhruv Raina traces intellectual exchanges and reciprocal influences between Western and Indian history and philosophy of science and their connections to national political projects and science policy. See: Dhruv Raina, Image and Contexts. The Historiography of Science and Modernity in India, Oxford 2003. Ksenia Tatarchenko: Rezension zu: Aronova, Elena; Simone Turchet (Hrsg. ): Science Studies during the Cold War and Beyond. Paradigms Defected. Basingstoke 2016 , in: H-Soz-Kult, 03.10.2017, <www.hsozkult.de/publicationreview/id/rezbuecher-27667>.